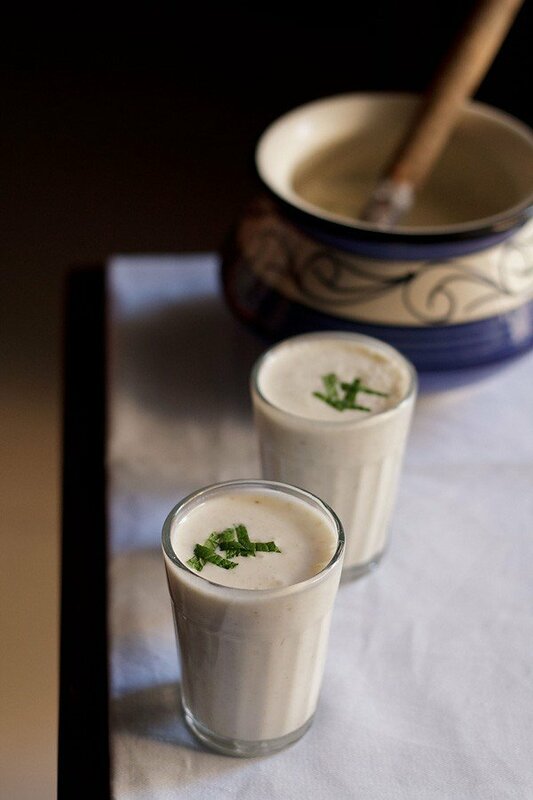 this namkeen lassi or salted lassi is a contrasting variation to the sweet lassi and preferred by some folks. spiced with black salt and roasted cumin powder. salted lassi is a cooling savory drink to beat the heat. 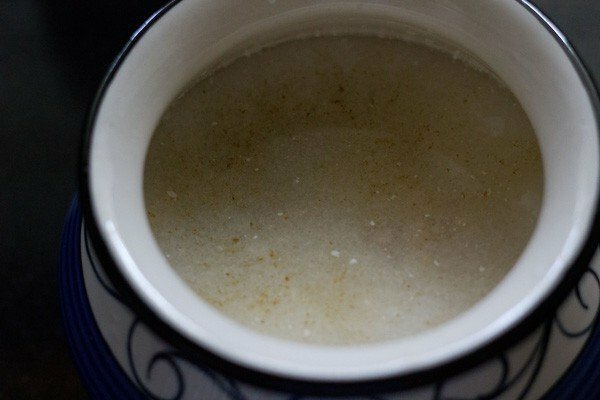 salted lassi recipe with stepwise photos – one more contrasting variation to the popular sweet lassi. 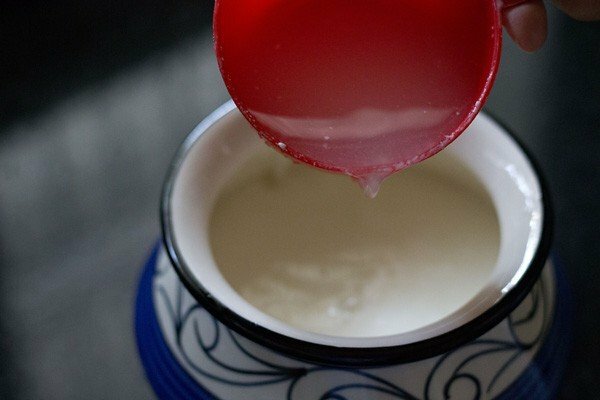 a cooling savory yogurt drink to beat the heat. 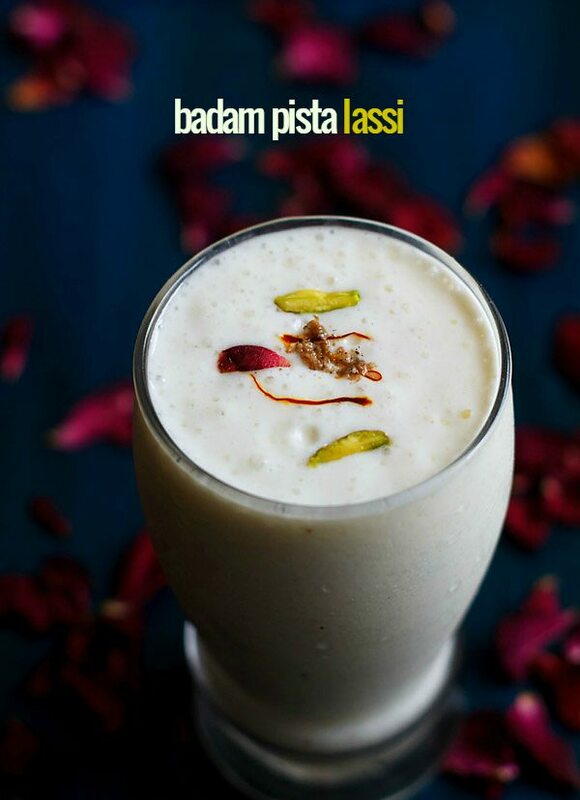 lassi is a very popular drink which is made during summers in india. there are many variations of making lassi. it could be sweet, salty or made with fruits also. i have already shared recipes of mango lassi and strawberry lassi. most people like sweet lassi but some people are also fond of namkeen lassi. my personal choice in lassi, will always be mango lassi. 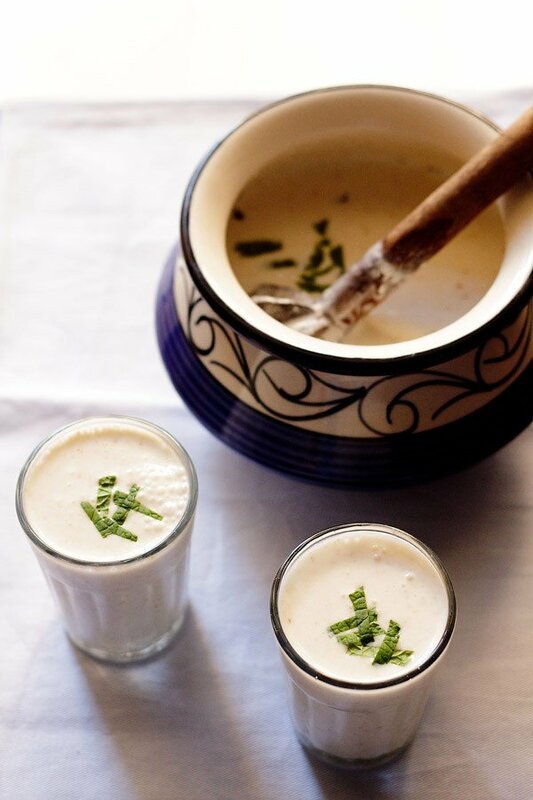 this salted lassi is flavored with black salt, roasted cumin powder and garnished with mint leaves. if you like the hint of black salt in drinks then you might like this lassi. if you do are not able to get black salt, then substitute with regular salt or rock salt. 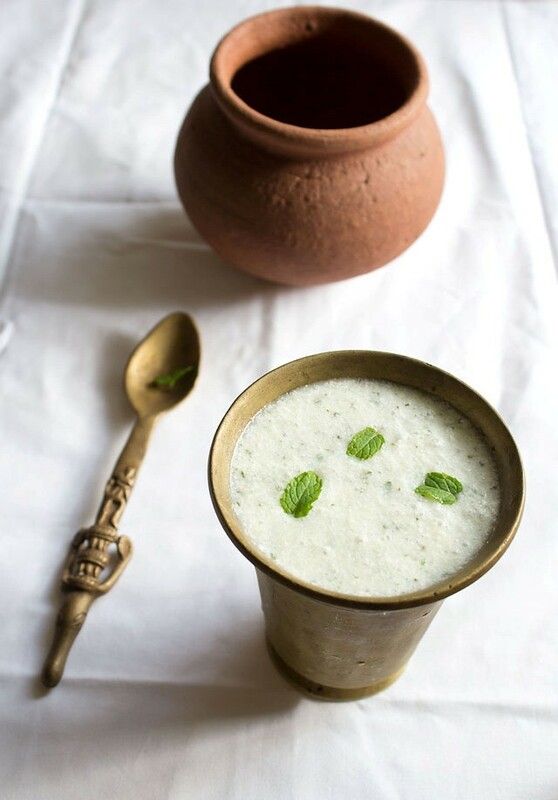 a variation to this lassi, is too blend some mint leaves with yogurt and you have nice refreshing mint lassi. some people also make this lassi just with yogurt, water and salt. take the chilled fresh yogurt in a bowl or pan. add chilled water to yogurt. sprinkle the salt and roasted cumin powder. a tip is to add 1/2 tsp of salt first. then once you blend everything, add salt accordingly. if you don't have cumin, then just dry roast 3/4 tsp cumin till fragrant, in a small pan or skillet/tava and then crush in a mortar-pestle till fine. with a wired whisk blend everything well till smooth. in the step by step pics, i have used the traditional indian hand held blender, known as madani in hindi. you can use an electric blender. pour the lassi in glasses. 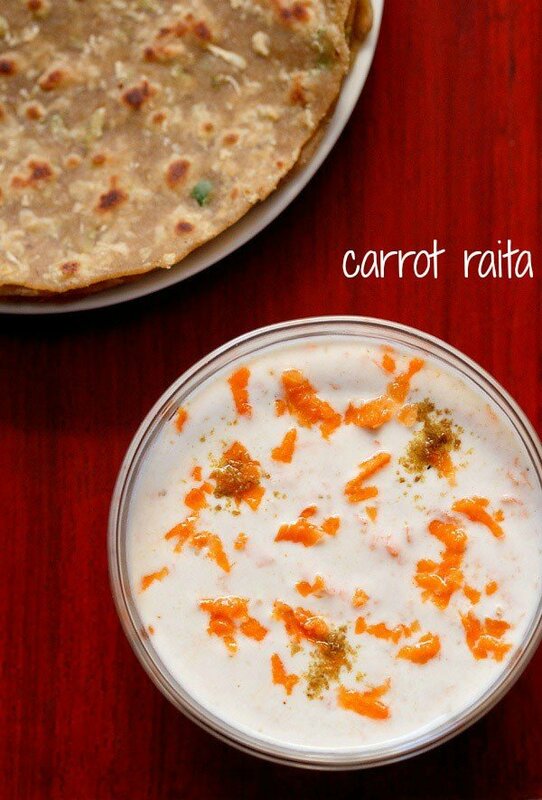 garnish with mint leaves and serve salted lassi immediately. 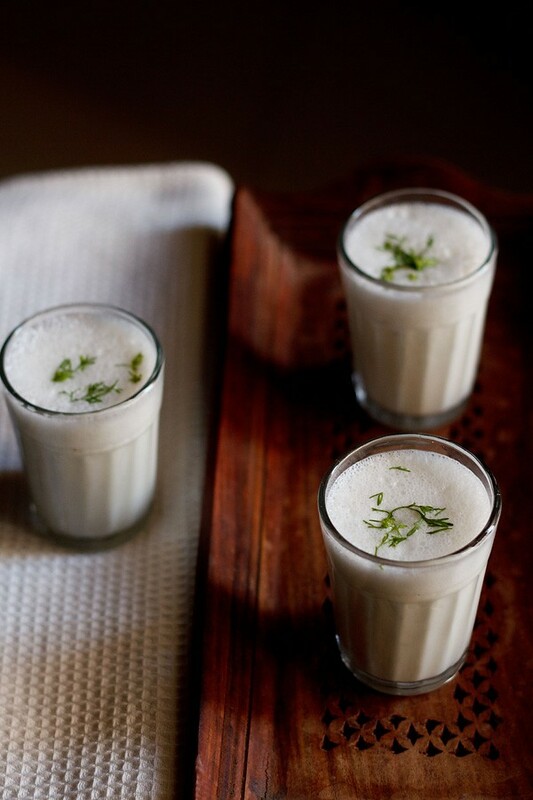 ice cubes can also be added or you can use the chilled yogurt and water to make this lassi. 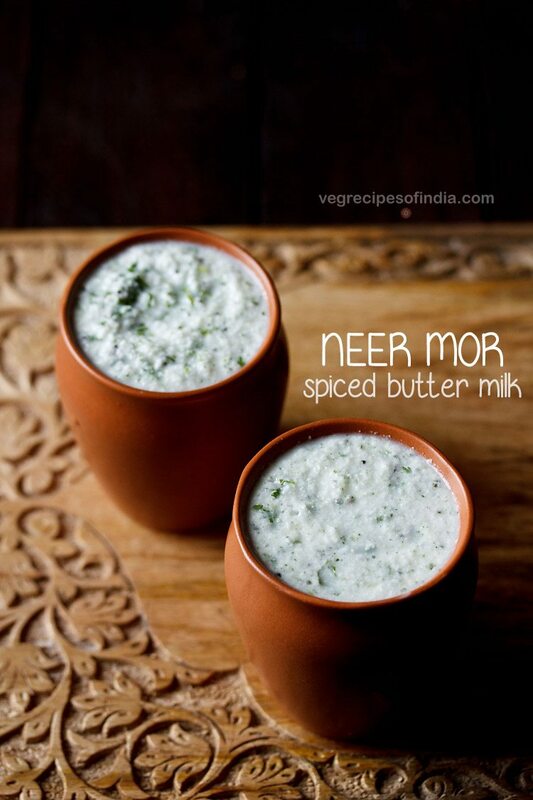 you can also refrigerate the namkeen lassi for a couple of hours, before serving. 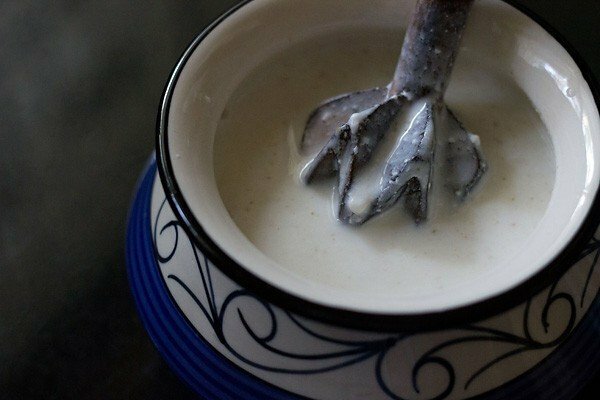 1. take the yogurt in a bowl or pan. 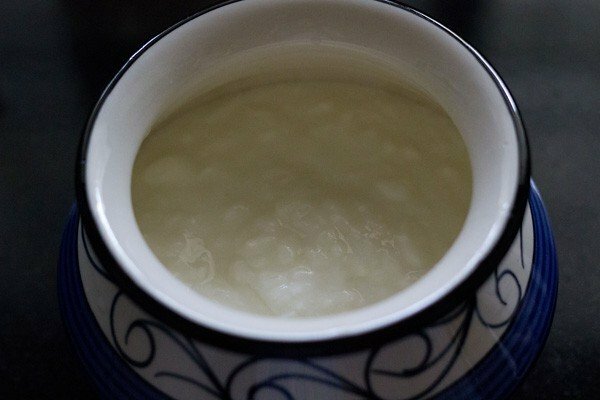 2. add water to yogurt. 3. sprinkle the salt and roasted cumin powder. if you don’t have cumin, then just dry roast the cumin till fragrant, in a small pan or skillet/tawa and then crush in a mortar-pestle. 4. with a wired whisk blend everything well till smooth. here i have used the traditional indian hand held blender, known as madani in hindi. you can use an electric blender. 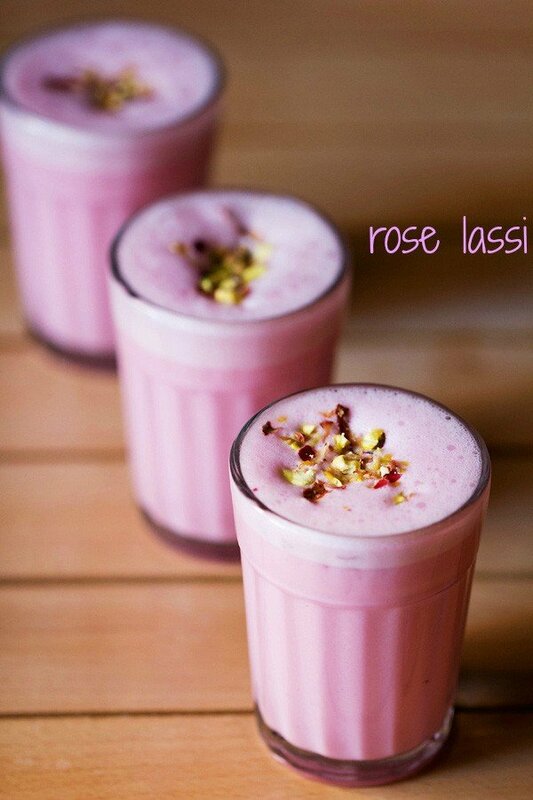 5. pour the lassi in glasses. garnish with mint leaves and serve salted lassi. 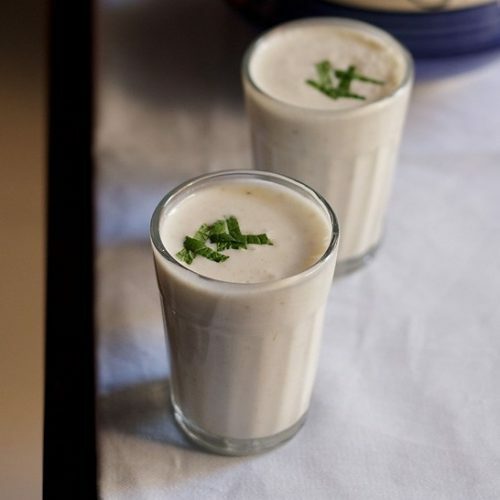 ice cubes can also be added or you can use chilled yogurt and water to make this lassi. I have realized I do not have plain black salt immediately on hand…do you think it would still taste good to substitute chaat masala in this? Or better just to use plain salt? JoAnne, you can add both together. Thanks for the recipe. And I will certainly look forward to other recipes. How are you? Went through all your lassi recipes. This one, and also, the sweet versions. Want to try them out next summer. My son, who is 10 yrs, is a big fan of lassi. Back in Kerala, we make a version of salted lassi with butter milk, a couple of lemon tree leaves (easily available there), crushed ginger, curry leaves, green chillies and salt. The addition of lemon tree leaves gives it a very distinct taste. thanks anu. also thanks for sharing the kerala version of buttermilk. i have noted down the method. the cold remedy, i generally make is rasam, either tomato rasam or pepper rasam. there is a medicine that we make for cold and coughs, much like ayurvedic recipe. but i have not yet added it on the blog. even just some turmeric powder with hot milk, is also good. Simply awesum recipes……a must try.thanx. Salt lassi is so inviting! thanks renu for your blessings.